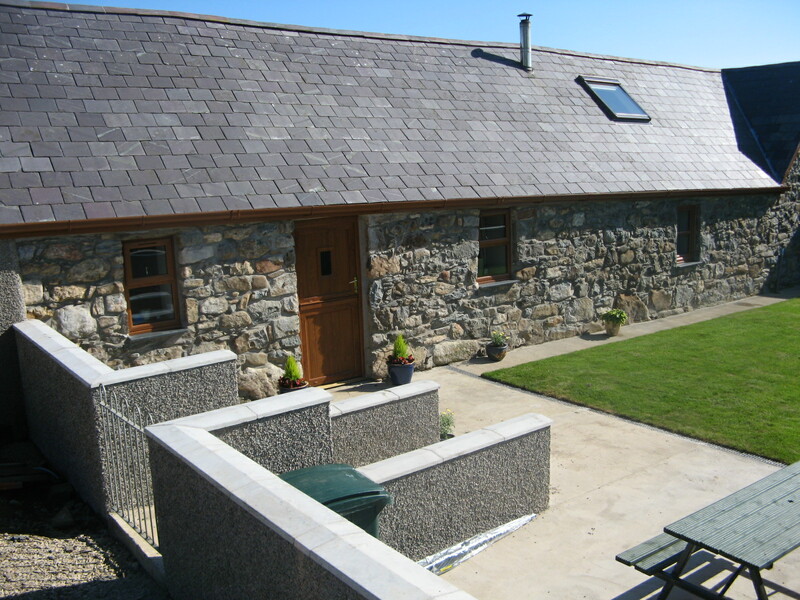 This newly converted self catering barn sleeps up to 5 people and is situated on a working farm off a small country lane in the heart of the Llyn Peninsula. All the main beaches such as Abersoch, Nefyn, Aberdaron, Llanbedrog and Porthdinllaen, Hell's Mouth Bay and Whistling sands are within 15-20 mins driving distance, including the town of Pwllheli. Snowdonia National park is around an hour's drive away. 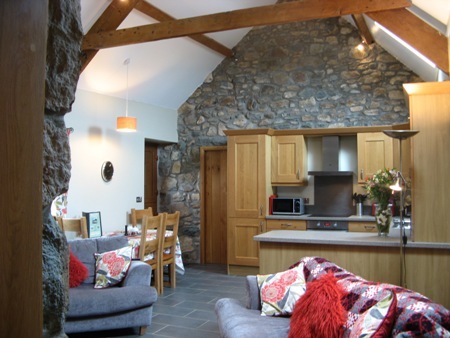 Graded by the Welsh Tourist Board a very high 4* rating - it offers the highest possible quality throughout. 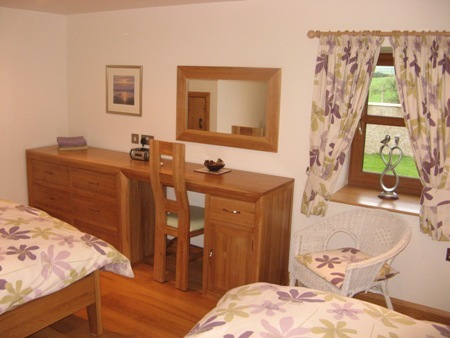 A lower ground bedroom and bathroom makes it the ideal accommodation choice for guests with limited mobility. Fully enclosed private garden with BBQ and picnic area, with ample parking for 2 cars . 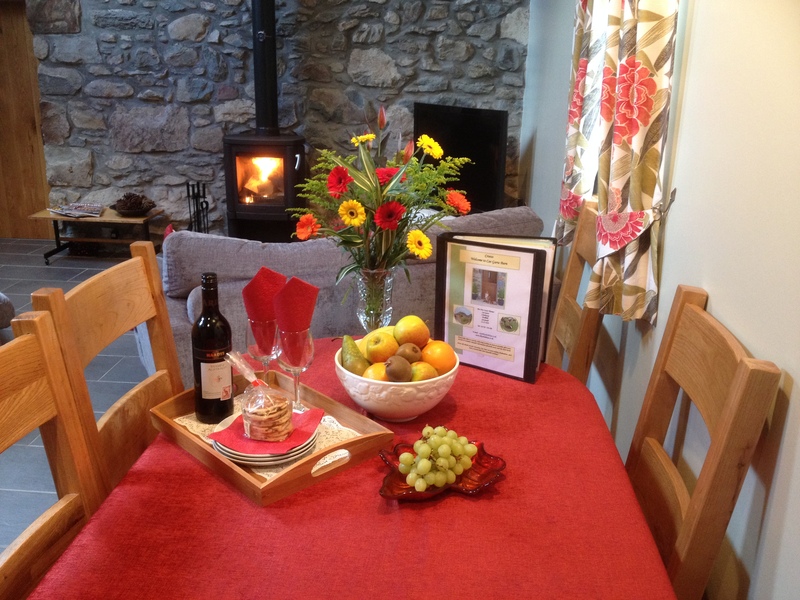 Dog friendly accommodation -Pets welcome at our cottage - (please see Terms & Conditions). Free Wi-Fi - with Superfast Broadband ! We operate a "Non Smoking " policy at both cottages. Please note that we are NOT within walking distance of a pub. The tiled open plan diner / kitchen/lounge has all the usual white appliances includes electric stove and ceramic hob, microwave , dishwasher , and washing machine - with the dining area overlooking Garnfadryn mountain and surrounding countryside. The lounging area has a contemporary wood burner that provides a feature against the original granite stone wall and restored beams. A TV , DVD and Wi-Fi access provides all the entertainment that you will need. Underfloor heating throughout provides warmth and comfort for you during the colder months. Downstairs also is a twin bedroom - again with oak flooring and furniture , with a built in storage wardrobe. The utility room consists of a washing machine and storage area for coats, walking boots, surfing gear etc. 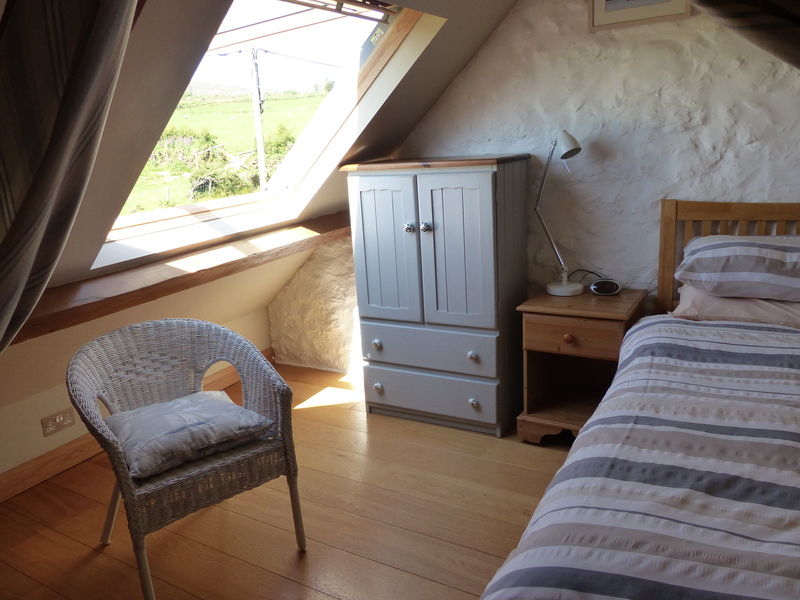 Up the oak staircase is a mezzanine single bedroom overlooking miles of stunning countryside through a Velux window . It has a limited headroom, and no door as such - being surrounded by banisters . A stair gate at the can be provided for younger members of the family . High chair and a travel cot can be provided upon request . Upstairs, the double en-suite bedroom has oak furniture, built in storage wardrobe, TV and oak flooring . See panoramic views of open fields without even getting up from bed ! ( a low beam across the bedroom gives the place a charming rustic feel!). 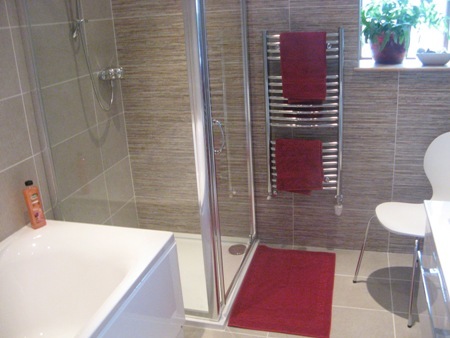 The tiled ensuite has a corner shower, wc, sink , and towel rail . The downstairs contemporary bathroom has a low level enclosed shower, bath, WC and a wall hung vanity unit with storage area. Bed linen and hand towels are provided in the rental. Enclosed private garden with BBQ and picnic area, with ample parking .